If your musical roots were cultivated in Philadelphia, singer/songwriter Amos Lee feels like home. Born and raised in the City of Brotherly Love, Amos definitely exudes that soulful Philly sound. 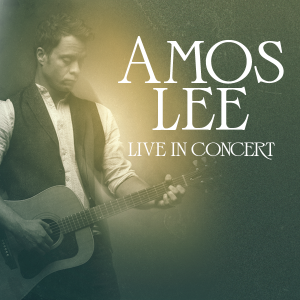 Like all great musicians, Amos Lee is not only a student of music, but a fan. He credits some of his biggest songwriting influences to be John Prine, Bonnie Raitt, Donnie Hathaway, Bill Withers, and Hall and Oates. He has collaborated with artists like Willie Nelson, Alison Krause, Patti Griffin and Lucinda Williams. Amos has also appeared on the compilation album The Music Is You: A Tribute to John Denver. Amos recently appeared with Daryl Hall on an episode of the Webby-winning webcast Live from Daryl’s House, getting the opportunity to sing with one of his major musical influences. In addition to having Daryl join him on his own songs, they paired up for H&O’s “I’m in a Philly Mood”(check out the video below) and even added a little rapping to “Method of Modern Love.” As the camera pans the room while the musicians play, their wide smiles say it all – these guys love what they do. Amos first picked up a guitar while in college, discovering music relatively later in life. He didn’t play for anyone until he was about 25. Amos worked as a bartender and in a record store, but most interestingly, as a second-grade school teacher. He found teaching left him little time for his true passion – music. Amos’ big break came in 2004 when Norah Jones asked him to open for her on tour. He has since opened for the likes of Bob Dylan, Adele, Paul Simon, Dave Matthews Band, the Zac Brown Band and Elvis Costello. Success hasn’t spoiled Amos Lee, who continues to live full-time in Philadelphia. You may even run into him on South Street, at the Art Museum, or Citizen’s Bank Park. He’s a favorite artist at Philly radio station WXPN, and has been an active participant in Musicians on Call, a non-profit organization that brings live and recorded music to the bedsides of patients in healthcare facilities since WXPN started the program locally. In 2013, Amos received a mayoral proclamation from Philadelphia Mayor Michael Nutter for both his musical output and his work with charities like Musicians on Call and Farm Aid. Amos’ upcoming appearance at AMT on Monday, June 9 is in support of his latest album Mountains of Sorrow, Rivers of Song.